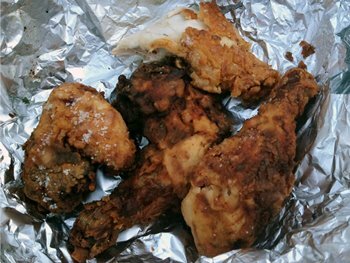 Fried chicken is one of the most delicious types of food, requiring little time to prepare. Franchises like Church’s Chicken and KFC have made a name for themselves worldwide by preparing fried chicken. Many people buy their products in excessive quantities, which at times they choose not to consume straight away but rather save the food for a day or two in their fridges. If you’re one of those people, you probably know that the chicken develops a peculiar taste that isn’t too pleasant for your mouth. In fact, it acquires a sogginess which makes the chicken far less tasty. The signature crispiness tends to be gone after a couple of days of fridge time, and the flavor gets dampened by the storage time. There are ways in which you can restore the chicken to its originally taste… Or, at least, to a state like the one it had back when it was pulled out of the fryer. Be sure to follow these steps closely and you’ll have a “restored” fried chicken in almost no time! 1.1 Prep the chicken by allowing it to rest in a room with no external heat. In the meantime, turn your oven up to 390°. 1.2 Grab one of your oven’s bake sheets and entirely cover it with aluminum foil. Then, evenly distribute each piece of chicken on top of it. 1.3 Get another piece of aluminum foil and cover the fried chicken with it. 1.5 Get it out of the oven and eat away! 2.3 Let it drain and eat it! Prep the chicken by allowing it to rest in a room with no external heat. In the meantime, turn your oven up to 390°. Your aim with the chicken will be to make all the pieces have a similar temperature. You’ll need everything to be the same to properly cook the fried chicken again – otherwise you’ll end up the process with some pieces tasting differently. In fact, differences in temperature might cause the entire piece of chicken to end up tasting different. Be sure to have the chicken in a spot where its hit by no sunlight either, and if you have AC in your home, be sure to either turn it off or put the chicken in a room that isn’t affected directly by the cold air. You’ll need to rest the chicken there for at least 30 minutes. During the same time, make sure to start preheating your oven to cook the chicken once it’s done resting. Your oven needs to be set to cook at a minimum of 390° and a maximum of 400°. It’s important that you get the temperature right – pay attention to the oven’s writings. Grab one of your oven’s bake sheets and entirely cover it with aluminum foil. Then, evenly distribute each piece of chicken on top of it. You might need to use a relatively wide piece of aluminum foil for this step, depending on how much chicken you’d like to cook and how large your oven is. Be sure to cover every part of the sheet in which the chicken will be placed. Place your pieces of fried chicken on top of the foil. Do not allow any piece to touch between themselves – you’ll need them to have some room if you want them to cook properly. Get another piece of aluminum foil and cover the fried chicken with it. The chicken needs to be entirely insulated for this process to work well. When you place the aluminum on top of the chicken, make sure that the chicken doesn’t move too much. Again – try to avoid having pieces too close to each other. 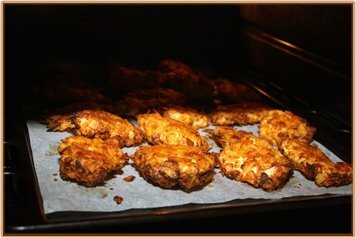 Simply give it enough time for it to rest and regain its crispiness in the oven. Twenty minutes should be enough, but if you feel like the chicken still isn’t as crispy as before, let it rest for an additional five. That’ll surely do the trick. Get it out of the oven and eat away! Carefully unpack the chicken from its aluminum foil cover, being careful not to burn your fingers while doing it. If you’re content with the way it feels, you’re all set! Otherwise, let it rest for an additional 5 minutes in your oven. This is done with the same purpose it has in the first method. You’ll need every piece of chicken to be at the same temperature for it to cook evenly. Once the chicken is rested for 20 minutes, heat a frying pan and prepare to pour a decent amount of oil on it. You’ll need enough oil to soak at least half the chicken on the pan! Set your kitchen’s fire to high and let the oil heat up before placing the chicken on the pan. Be sure to approach the pan carefully. Use a pair of kitchen tongs to place each piece on the oil, preventing splashes and avoiding harming your skin. Do not overcook it! Constantly check its state to make sure the chicken feels just like you want it to. Let it drain and eat it! That’s it! You’ll need to allow the chicken to drain the oil on top of a rack. Do not use napkins or paper towels – that would make certain parts of the chicken rest in small ponds of oil formed in the towel, which makes it retain unnecessary heat and sometimes overcook itself. 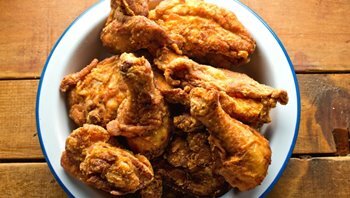 Although getting your fried chicken back to its best state isn’t a difficult process, there are a couple of things you should know before getting started. For example, you might be tempted to use a microwave to reheat your chicken… Sadly, it’ll only make it taste worse. Microwaves have a system which is great for reheating almost any type of food, but fried chicken stays dry and doesn’t regain its crispy properties. The heat kind of melts the exterior of the chicken skin, making it a displease to eat. Avoid using frying pans without oil and toaster ovens as well. Either of these two will just cook the chicken unevenly, meaning you’ll end up with an inconsistent taste. The easy way to do it is hardly the best – be patient and use any of these two methods if you want your chicken to feel “freshly fried” once again. What you really need to do with fried chicken is basically “cook it all over again”. 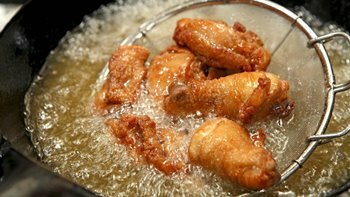 You’ll have to follow simple steps, regardless of the method of your choosing, and simply watch it regain is crustiness as it cooks with the heat (or frying oil). Once you’re done, your chicken will taste and feel almost exactly the same as it did when it first came out of the fryer!